This decorative ceramic tile has a unique curvy interlocking hand-carved design that will make a statement. Even though it is beautifully sculpted, it is easy to keep clean because it features a smooth surface. This particular tile can be used for either interior or exterior use depending on the type of clay body and glaze you choose. To create different visual effects, you can select different glazes for high and low components or contrasting grout colors. 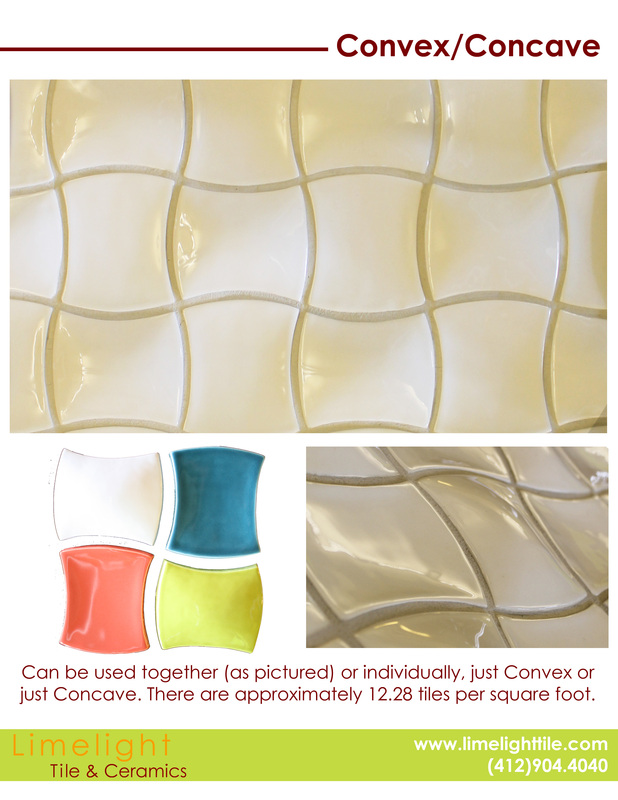 The convex or concave ceramic tiles are available in the entire standard and custom glazes to ensure you can create the color scheme you want. When installed, a group of four tiles laid in a “square” has a pattern repeat of 7” wide by 7” tall. If you are searching for more custom ceramic tiles for your business, turn to Limelight Tile & Ceramics for endless possibilities. We can create custom ceramic tile patterns for you or you can choose from our existing selection.